My focus is supporting women’s health. 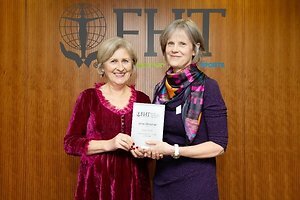 I combine The Fertile Body Method treatment, hypnotherapy and reflexology to support women experiencing issues with fertility, and throughout pregnancy and menopause. I am a fully qualified and insured complementary therapist offering reflexology, shiatsu, hypnotherapy, and reiki and I have started working at The Barn Beauty Rooms Norwich which is situated at White House Farm, Sprowston. White House Farm is a lovely venue for shopping or visiting the cafe for a coffee and cake. You will always receive a warm friendly welcome when you come for your reflexology or shiatsu treatment and my therapy room is a calm space where you can relax and revitalize. My focus is supporting women’s health. 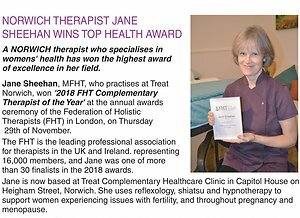 I combine fertile body treatment, hypnotherapy and reflexology to support women experiencing issues with fertility and to support women through pregnancy and use hypnotherapy to help women manage anxiety in pregnancy and to have a positive birth experience. I also work with all aspects of family health, including children, teenagers, fertility, pregnancy and menopause and elderly and palliative care. A short consultation is included in your first appointment so that we can discuss your individual needs and plan your care holistically, creating an effective programme for you, using one particular therapy or a combination of therapeutic practices. I’m happy to answer any of your questions before, during or after the practice, to put your mind and body completely at ease. Whether you want to ease symptoms of stress, anxiety, and tension, or simply a nurturing hour of bliss where you can chill out in peace, you’ll find the treatment you need here. 07712 661020 to book an appointment or fill in the form below and I’ll contact you as soon as possible I offer pregnancy care using hypnotherapy and reflexology to support women during pregnancy/link Fertility Reflexology, Hypnotherapy & the Fertile Body Method can all help reduce stress. Menopause Link Reflexology may help improve mood, release tension and aid sleep. Link Reflexology/Shiatsu should never be used as a substitute for medical advice so if you are concerned, consult your medical practitioner. MANY women wait until they have something 'wrong' with them before they see me, for example, headaches, insomnia, hot flushes, or feeling generally tired, stressed and run down. They may view a treatment as a last resort, or a 'treat' that's not really necessary. Ideally I would love clients to come as a matter of course - a bit like how we take our car to the garage for regular servicing - after all, we wouldn't expect it to keep running without top-ups of oil, water, and new tyres. Our bodies are always striving towards health; reflexology and shiatsu enable you to experience a state of deep relaxation, encouraging the body to rebalance and revitalise. Think how much better your car drives when it's tyres have been rebalanced! As a trained nurse, I understand we sometimes need medical intervention too, but complementary therapies can help us to help ourselves on our journey to wellness. Jane taught M Technique Practitioner training at Treat Norwich last week. It was an interesting and well-planned course. Jane is a knowledgeable and thoughtful teacher able to adapt her teaching style to suit the students attending. I thoroughly enjoyed the course and highly recommend Jane as the M Technique instructor. Thank you!